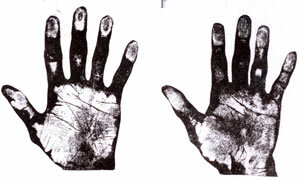 These two right hands, Plates V and VI, are good examples of heredity as shown by hands. It will be noticed that the shape is similar in both father and son, while the lines are very much alike. I took these impressions in Mr. Chamberlain's private room in the House of Commons. Mr. Chamberlain was keenly interested in my predictions that his son Austin was destined to follow the same political career that he had done. 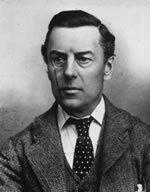 It is common knowledge that as the years went past, Austen Chamberlain rose one by one to the exalted positions his father had once occupied in the Government. He entered Parliament at the same age, and successively filled the positions of postmaster General, Chancellor of the Exchequer, Leader of the House of Commons and finally received knighthood for his services as President of the Locarno peace Conference after the war. Further, he suffered the same class of illness, which his distinguished father passed through and at the same periods of his life, even to the serious nervous breakdown that caused him to retire from public life (see health-line attacking the line of life) which caused paralysis to his father in his sixty-third and sixty-fifth year.